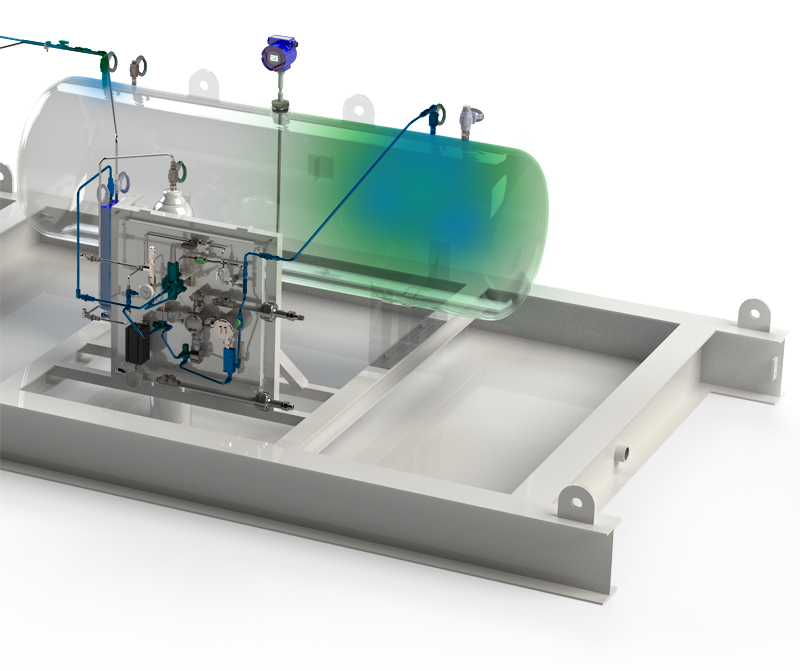 The Welker OdorEyes ECOsystem™ Pulse Bypass System is designed to infuse the customer pipeline proportional to flow with natural gas that has been supersaturated with vaporized odorant. This skid-mounted automatic bypass system has three primary components: the touch screen controller, the valve section, and the odorant supply tank. Each primary component plays an integral role in the operation of the ECOsystem™ and can be customized to better suit each application. The ECOsystem™ supersaturates carrier gas in an odorant tank to properly odorize natural gas pipelines. The ECOsystem™ enhances odorization by saturating natural gas drawn from the pipeline with vaporized odorant. As flowing conditions within the pipeline change, the system automatically adapts odorant infusion to be proportional. Natural gas is directed through the ECOsystem™ with only a few moving parts to help minimize the chance of a leak in the system. The odorization tank is downstream of any mechanical operation, leaving any potential system leaks odorant-free. The ECOsystem™ makes odorant monitoring convenient and efficient with remote access to the system using a computer connected by Ethernet, modbus or modem . The integrated PLC has the ability to automate the odorization process. 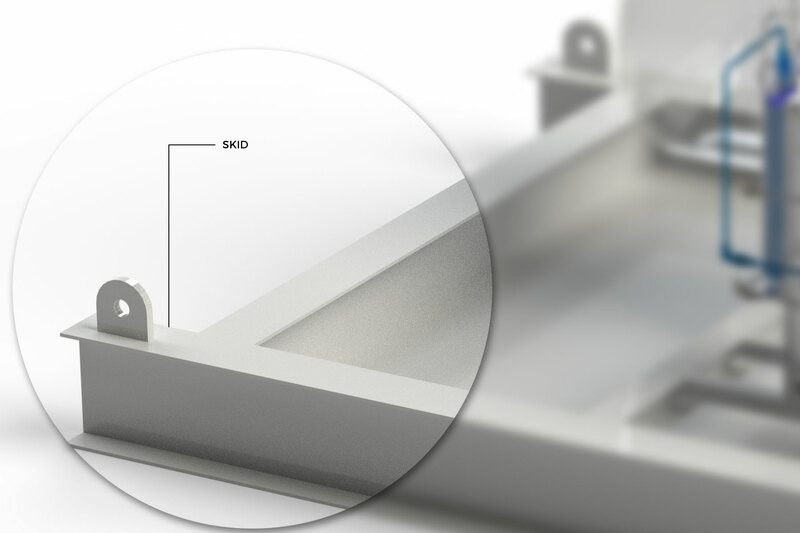 The ECOsystem™ skid provides 110% containment to keep the ground odorant-free in the event of a tank leak. The ECOsystem™ provides 110% containment to keep the ground odorant-free in the event of a tank leak. Low-wattage primary and backup solenoids control the flow of gas through the saturation tank and into the pipeline. Each time a solenoid opens, the controller uses a flow switch to confirm positive flow. If the primary solenoid fails to open, an over-odorization alarm activates and the backup solenoid automatically takes over flow management. Pipeline gas enters the system and immediately flows into the integrated F-5 Filter/Dryer. Liquids and unwanted particles are filtered out of the gas before it is saturated with odorant. The electronic level indicator continuously measures the tank odorant level in inches, pounds, or gallons. Odorant level data is stored on the PLC in real-time for instantaneous remote monitoring. The integrated regulator maintains the required pressure differential between the gas inlet and gas outlet. A stabilized pressure differential allows the ECOsystem™ to evenly distribute odorant to the pipeline system, regardless of varying downstream pressures that can be associated with peak gas usages. The PLC continuously monitors changes in gas flow rate and automatically adapts the amount of odorized gas released into the pipeline. The PLC features Class I, Div. 2 approval with optional Class I, Div. 1 approval if required for the application. System status and alarms can be remotely monitored via Ethernet, Modbus, or modem. The system alarms conveniently makes the information about operational issues available for assessment prior to going on-site. The system history is logged to a microSD card in CSV format to track important data and settings. Vaporized odorant saturates natural gas inside the tank proportional to pipeline flow. With the tank located downstream of moving parts, system leaks that might occur from normal wear-and-tear remain odorant-free. Multiple tank sizes are available to accommodate different capacities or flow rates for convenient long-term odorization.